Years ago, when I was taking one of my first memoir workshops, I remember a classmate reading aloud to the class what she had written. She was very excited about her project—a book about her cancer diagnosis and subsequent treatment. What she read aloud to us was her reaction in the moments after finding out her cancer had returned. Specifically what I remember is a long sentence that went something like this: “I cried, I was angry, I was sad, I was scared, I was confused, I was distraught,” and the sentence went on to include a greater list of difficult emotions. As a listener, I understood her emotions on a mental level, but I didn’t actually feel any of the things that I knew as a writer she was hoping her readers would feel. Fast-forward to a couple of weeks ago, when I was preparing an author talk to a group of writers: the Lost State Writers Guild. Because I am usually speaking to a group of readers (who aren't typically writers), my author talk centers around life lessons I have been given, but because this time I was speaking to writers, I also wanted to give more insights into the writing lessons I have learned over the years. This meant opening my talk with a new poem. As I mentioned in an earlier blog post, I always start my author talks with a poem I love, written by someone else, that has inspired me. The one I chose for this particular talk to Lost State was one I had come across by Chloe Clark on Twitter back in April. The writerly lesson is this: when emotions run high (or what some people call “hot”), write cool, meaning don’t describe anger or sadness or crying. Instead, have some distance and coolness in how you convey these. Thank you, Chloe Clark, for allowing me to read it at my talk and to post it on my blog. This poem is quite a beauty. And thank you, Lost State, for asking me to speak to your group. 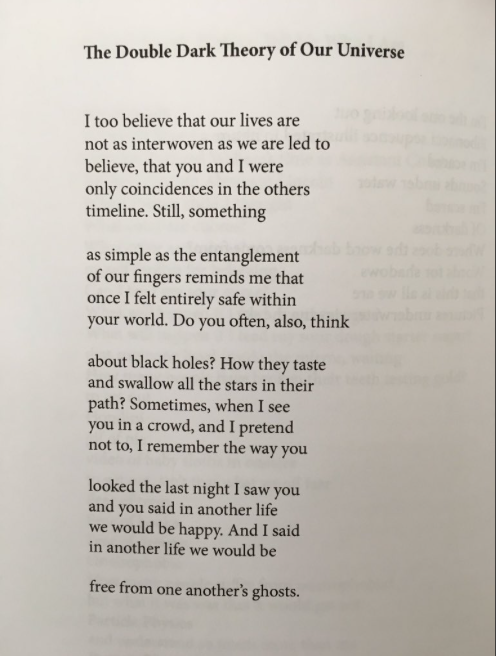 "The Double Dark Theory of Our Universe" is part of Chloe Clark's book, The Science of Unvanishing Objects: Poems (Finishing Line Press, 2018). The red flower pictured is from the lovely geranium that the Lost State Writers Guild gave me as a thank you. It is gracing my living room window as I type this.